You take 2 vitamins each day with a glass of water. For the best effect you can start with taking these vitamins 1 till 2 weeks before you leave on vacation. Or you can start directly if you aren’t going on a vacation because this sunny weather is perfect to start with these supplements! But remember these vitamins don’t replace your suncream, so always protect you well against the sun! What does these vitamins do? But if these don’t replace your suncream what than does they do? These sun vitamins are food supplements that helps to prepare the skin for the sun, and also to optimize and extend your tan. These vitamins contain strong concentrated ingredients like copper: boosts the natural pigmentation of your skin, pro-vitamin A & zinc: helps to keep your skin healthy, antioxidant complex, vitamin E, selenium: helps to protect cells from the oxidative stress which can result from exposure to the sun. I tried these vitamins these summer, and I’m normally the person by who it’s hard to get a tan and despite how much suncream I use it sometimes gets sunburn. Now that I’m finished with this treatment, I’m for sure convinced of this! The results that you will get depends from person till person. But I saw that I finally got a (light) tan, and for me is that a whole thing! I also didn’t have any problems that I got sunburned, and when I slightly got sunburned it was directly gone! In these you find 30 supplements, so this is perfect for 15 days. If you ask me is this the perfect treatment to do each year during the summer! And like I said before you even can use these vitamins in your own country with the sunny summer! 😉 So if you want a quicker tan and protect your skin, then are these vitamins just perfect for you! These are so good! But keep in mind, that even when you use these you must protect yourself with suncream! 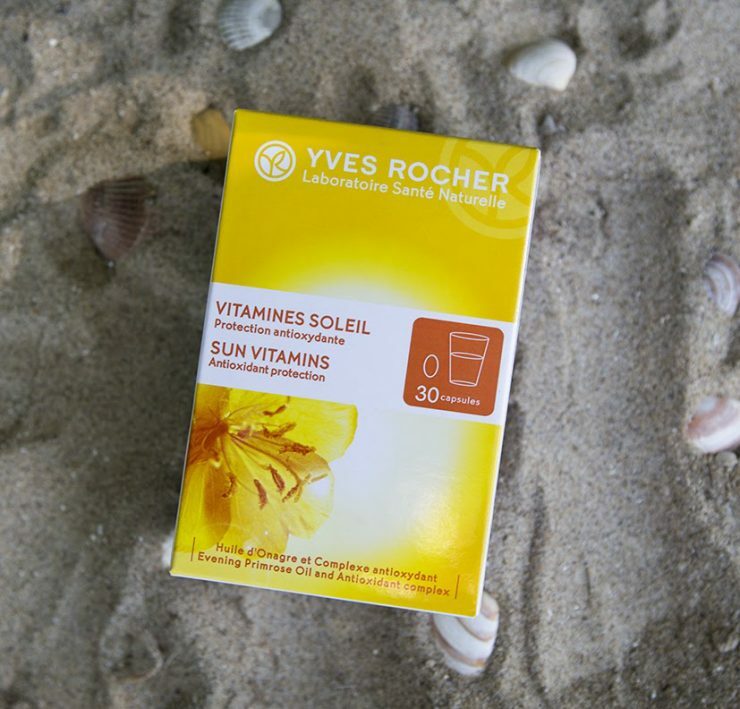 Price: A box with sun vitamins from yves rocher with 30 pills cost €23,90 and these are on the webshop one of there best sellers! So I’m for sure not the only one that is fan from these! Oh, and remember yves rocher does a lot of special actions, so with some luck you can buy these supplements for a better price!